They were created during a crucial moment in America's history, chosen from the U.S. Navy's finest divers, and forged into one of the most elite fighting forces in the world. In the sea, on the land, or in the air, the SEALs were created to deal with the most dangerous territory Vietnam could offer. SEALs in Vietnam is filled with the facts you need to play one of the U.S. Navy's elite warriors during the Vietnam War. It includes a detailed history of the Teams during the era, with new SEAL templates, vehicle lists, and equipment. This book also discusses actual declassified operations, and gives suggestions on creating your own missions, providing a background for heroic action in a high-speed environment. 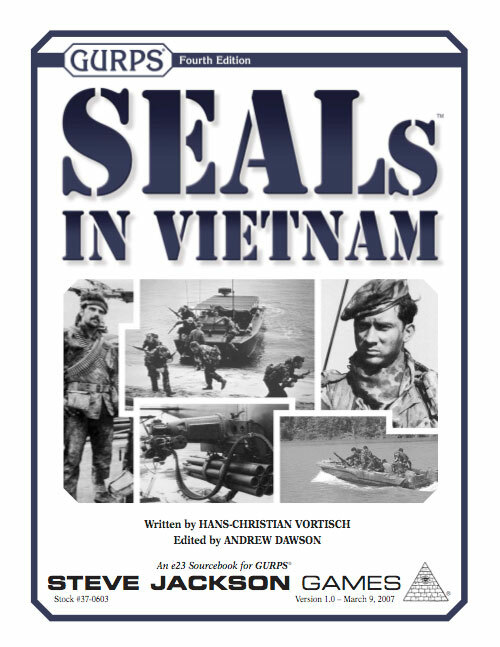 Although this book focuses on the SEALs' activity in Vietnam, the information on the Teams can be used in a GURPS Horror or Infinite Worlds campaign (including Black Ops and Technomancer) in the same timeframe. This supplement is also compatible with e23's Funny New Guys, a Technomancer adventure set in Vietnam. 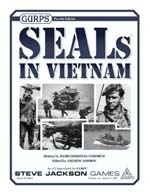 SEALs in Vietnam requires only GURPS Basic Set; some readers will find GURPS Special Ops, GURPS High-Tech, and GURPS Martial Arts to be useful. GURPS Tactical Shooting – Rules and information on realistic guns and shooting, plus tactics that would've been used by the SEALs.